1.1 What is a geographic DNA project? Who are we? Where do we come from? Those are questions that each of us has been wondering about at one time or another. We all created an individual or a national identity based on what we were taught since childhood. At school, we heard of the Gauls, the Romans, the Franks, the Visigoths, the Burgundians, the Huns, the Vikings... They all invaded and settled in our regions down the centuries and left descendants behind them whose genes are within us today. But which ones of them have had the greatest impact on the genetic makeup of the current population? Where did the Romans settle most heavily? Are some regions more Roman than Celtic? Did the ancient Belgae survive the Roman and Frankish conquests? Are Belgians more genetically Frankish or Gallo-Roman? Did the few thousands of Alans and Huns who came from Central Asia in the 5th century still have descendants today, and if so in what areas and in which proportions? Are there pockets of isolated ethnicities in unexpected parts of France? Why is it that the French don't all look like a unified ethnicity from one region to another? Why are Provençals so different from Bretons and Alsatians so unlike the Gascons? What about modern Belgium, this small country divided by unending linguistic quarrels? Do Flemings and Walloons really have different origins? It is easy to claim that the Flemings are of Germanic descent just because they speak a Germanic language. This type of reasoning has already proved false in the case of the South Germany, where the Neolithic, Celtic and even Roman inhabitants remained slightly dominant genetically compared to the later Germanic invaders. Are Flemings and Walloons really genetically divided across linguistic lines, or could there be unexpected unity among them, or on the contrary inter-provincial differences more marked than regional ones? For the first time in history, these issues are going to have a scientifically provable answer, thanks to DNA. Get ready to know who were really your ancestors. 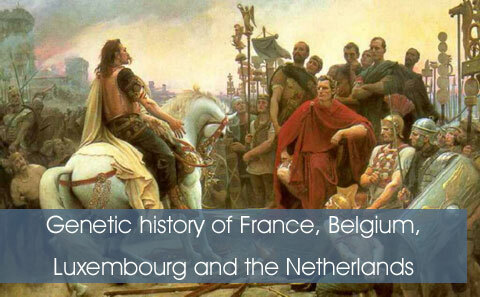 The goal of this project is to estimate the percentage of Celtic, Germanic, Greco-Roman ancestry, or other in each region and department of France, in each province of Belgium and the Netherlands, as well as in Luxmebourg. Anyone man contribute by testing his Y-DNA (or that of his father or brother for women) with one of several independent commercial companies (see list). Indeed, it is now possible to determine our ancient ethnic origins by testing the DNA of the chromosome Y (Y-DNA), inherited way unchanged from father to son (see FAQ). At the individual level, this only tells us where our own patrilineal ancestors (related to our family name) originated. It is by bringing together the results of hundreds or thousands of people from each region or country than the bigger picture emerges, and that it becomes possible to determine the percentage of Celtic, Germanic, Roman, or other ancestry in each region, thereby answering all the above questions about our origins and our history. What is a geographic DNA project? A geographic DNA projects aim at better understanding a region's genetic make-up and genetic history by looking at the distribution of paternal lineages inherited through the Y chromosome, known as Y-chromosomal haplogroups. Many geographic DNA projects already for most European countries. Data for France and Wallonia is particularly scarce though, which is why Eupedia thought of creating this project. DNA tests have become cheap enough in the last few years for almost anyone to participate in such a project. For more information on which DNA test to choose, please check Ancestral DNA tests: what should I know before I start? 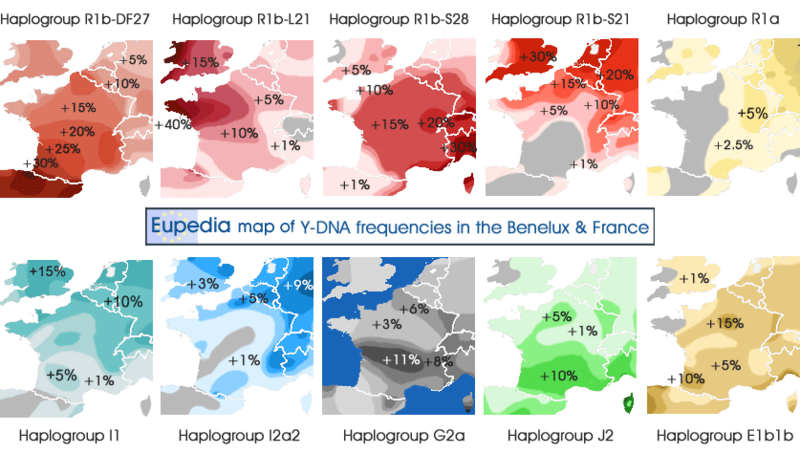 In the following section we will review the Y-DNA haplogroups of the various prehistoric and historical populations that have settled in the Benelux and France since Cro-Magnon colonised Europe during the Ice Age. that If you are unfamiliar with haplogroups or population genetics, we recommend that you familiarise yourself first with the basics by viewing the Video Tutorials about genetics and read our Frequently Asked Questions about DNA tests. Each haplogroup corresponds to a distinct ancestral lineage. Haplogroups are divided into numerous levels of subclades that form a phylogenetic tree, which is just a fancy word for genealogical tree of genetic ancestry. You may also find it useful to visualise the modern distribution of Y-DNA haplogroups to get a sense of they represent. Detailed descriptions of each haplogroup and their history are available here, but links to each haplogroup's page are also provided in the text below. The history of Western Europeans starts approximately 35,000 years ago with Cro-Magnons, the first Homo Sapiens to colonise Europe. They left the Near East 45,000 years ago and progressed very slowly from southeastern to western Europe, intermingling with the autochthonous Neanderthals on the way. The two oldest samples (one male, one female) from Western Europe are 35,000-year-old individuals from the Goyet Cave near Namur in Wallonia tested by Posht et al. (2016). The man belonged to Y-haplogroup C1a, a lineage that is virtually extinct in Europe today but survives in Japan (see Genetic history of the Japanese). Both samples belonged to the maternal haplogroup M, whose descendants are also found essentially in Asia today (including East Asia). Goyet Cave is famous for being the site of the world's oldest reported case of dog domestication, 32,000 years ago. In total, a dozen Paleolithic European Y-DNA samples have been tested to date. The first migrations of Homo sapiens to Europe, linked with the development of Aurignacian culture, brought old haplogroups like BT, CT, C1, F and IJK simply because other haplogroups further down the phylogenetic tree did not exist yet. It is possible that even the West African haplogroup A1a reached Europe during the Paleolithic by crossing the Strait of Gibraltar, as some sub-Saharan African admixture regularly shows up in Mesolithic and Paleolithic samples, and modern A1a samples has been found in the northern fringes of Europe (Ireland, Norwegian Lappland, Finland) which cannot be explained by any more recent migration. The robust people of the Aurignacian were succeeded by more gracile people during the Gravettian period (32,000-22,000 years ago). Nonetheless, Gravettian paternal and maternal lineages do not seem to differ much from Aurignacian ones. Five Gravettian samples from Goyet Cave, dating from c. 27,000 years ago, all belonged to mtDNA haplogroup U2 (no Y-DNA was tested), a maternal lineage found among at low frequency throughout Europe today (U2e), but also in Central Asia (U2d) and South Asia (U2a, U2b, U2c). Another Gravettian sample from La Rochette in Dordogne also belonged to mtDNA haplogroup M, like the older Goyet samples. This shows that Eurasian lineages were not yet clearly differentiated at the time. At present, the oldest samples confirmed to belong to Y-haplogroup I date from the Magdalenian (17,000-12,000 years ago) and the Azilian (12,000-9,000 years ago), with I* and I2* samples tested in Baden-Württemberg, Switzerland and Franche-Comté. In conclusion, most of the Aurignacian and Gravettian male lineages associated with Cro-Magnons are extinct in France and the Low Countries today, apart from the very rare C1a2. About 8 to 10% of modern French, Belgian and Dutch maternal lineages descend from Cro-Magnon (U2e, U5, U8). These lineages were already the only ones that managed to survive until the Epipaleolithic period, after the Last Glacial Maximum (24,500-17,500 BCE). They would prosper during the warmer Mesolithic period. The Mesolithic period (c. 12,000-7,000 years ago) started at the end of the last Ice Age around 10,000 BCE and lasting until the adoption of agriculture (from circa 5500 BCE in southern France until 4000 BCE in the northern Netherlands). Mesolithic samples begin to show signs of diversification within Y-haplogroup I, with the appearance of I2a1, I2a1a1a, I2a1b and I2c2 samples. Other subclades like pre-I1, I2a2 and I2c1 will surely be uncovered later. Older Paleolithic haplogroups like BT, CT, C1a, C1b and IJK seem to have disappeared entirely by the Mesolithic, leaving only a few C1a2 individuals, a lineage that still exists in Europe today but at extremely low frequency (< 0.1%). Haplogroups J, R1a1a and R1b1a were found in Mesolithic Russia, but not in western Europe. On the maternal side, the old Aurignacian lineages like M, N, R, U, U2 and U6 have either disappeared or evolved into new haplogroups like U2e, U4, U5a and U5b. Mesolithic Western Europe is strongly dominated by U5 lineages (90% of samples from Mesolithic Germany and Luxembourg, and 100% from France), which undergo a remarkable expansion, diversifying into a multitude of U5 subclades, such as U5a, U5a2, U5a2c, U5a2c3, U5b, U5b1, U5b1a, U5b1b, U5b1d1, U5b2a2 and U5b2c1, among the samples tested to date. In conclusion, the Mesolithic inhabitants of the Benelux and France would have belonged primarily to Y-haplogroup I2 and mt-haplogroup U5. The 8,000 year-old Loschbour man from Luxembourg, tested by Lazaridis et al. 2014, is the epitome of the West European Mesolithic man. He belonged to Y-haplogroup I2a1a and mt-haplogroup U5b1a. Nowadays, 7.5% of men in the Benelux and 6.5% of French men belong to haplogroup I2. Nevertheless, at least half of these I2 lineages do not descend directly from the Mesolithic inhabitants of these countries, but from the Mesolithic inhabitants of Central and Eastern Europe. Some were assimilated by Neolithic farmers in the Balkans and Central Europe and came to the Low Countries and northern France with the expansion of the Linear Pottery culture. 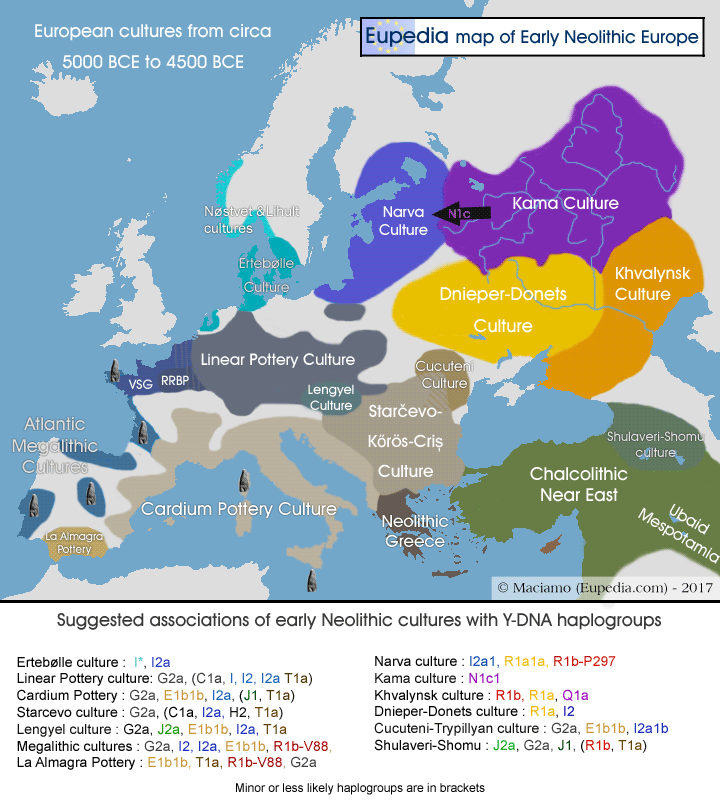 Others, like I2a2a-L699, were native to the Pontic Steppe and became Indo-European lineages that migrated to Western Europe during the Bronze Age. I2a2b-L38 and I2c1 are thought to have spread with the Celtic expansion from southern Germany and Austria during the Iron Age, while I2a2a-L801 would have come with the Germanic migrations during the Late Antiquity. I2 clades that are likely to descend from Mesolithic West Europeans include I2a1a-CTS595, I2a2a1a1-Y3721, I2a2a2-Y6038 (see I2 phylogenetic tree). The Neolithic period saw the advent of agriculture (livestock herding, then cereal farming), the use of pottery and the replacement of the nomadic lifestyle by sedentism. Originating in the Fertile Crescent circa 9500 BCE, the Neolithic spread through Anatolia and Greece, then its diffusion split in two routes. The southern route went across the Mediterranean to Italy, southern France and Iberia, and evolved into the Printed-Cardium Pottery culture (5000-1500 BCE). The northern branch developed in the Balkans as the Starčevo culture (6000-4500 BCE) and the Linear Pottery culture (LBK) (5500-4500 BCE), following the Danube and its tributaries until Germany, northern France and the Benelux. It has been suggested that the modern divide between northern European cultures, favouring butter-based cooking, and southern European cultures, preferring olive oil-based cuisine, dates back from the Neolithic period. The Near Eastern Neolithic herders and farmers who colonised Europe appear to have belonged predominantly to haplogroup G2a (60% of Neolithic European samples tested to date), with minorities of haplogroups E1b1b, H2, J2a, R1b-V88, and T1a, especially around the Mediterranean basin. Ancient DNA tests have confirmed the present of G2a in all Neolithic sites in Europe tested to date, including numerous samples from the Cardium Pottery, Starčevo and and Linear Pottery cultures. As the centuries and millennia passed Neolithic farmers started blending with the indigenous Mesolithic inhabitants of the lands where they settled. Early Neolithic sites from Central and Southeast Europe (Starčevo, Sopot, Lengyel, LBK) revealed the presence of a few C1a2, I*, I1, I2a and I2a1 individuals. In Southwest Europe, the Cardium Pottery culture gave way to the Megalithic culture (5000-2000 BCE), which spread all over the Atlantic region, with particularly strong presences in Portugal, Galicia, Brittany and the British Isles. Megalithic people were very probably a blend of native I2 people and Near Eastern immigrants (G2a, and probably also E1b1b, R1b-V88 and T1a). Lacan et al. (2011) tested the Y-DNA of two Megalithic men from Burgundy, France, and both belonged to haplogroup I2a1. They found two other I2a1 men (among 21 G2a individuals) in Late Neolithic sites in Languedoc. Mathieson et al. (2015) also confirmed the presence of an I2a2a1b2 (Z161) individual in Megalithic Spain. During the late Megalithic period, the Neolithic society progressively evolved into a Chalcolithic (Copper Age) one, apparently without significant societal changes, nor major external gene flow. The great upheaval in both culture and genes came during the Bronze Age, with the arrival of the Indo-European speakers, who originated with the Yamna culture (3500-2300 BCE) in the Pontic Steppe, to the north of the Black Sea. Maternal lineages brought by Neolithic farmers from the Balkans and Anatolia can be safely ascertained by the large number of ancient mtDNA already tested. They included haplogroups HV, H2a2, H5a, H13, H20, J1c, K1a, N1a, T1a, T2 and X. There were two distinct, though related, groups of Proto-Indo-Europeans: the southern R1b-L23 branch, linked with the diffusion of the Greco-Anatolian, Albanian, Italic, Celtic and Germanic languages, and the northern R1a-M417 branch, associated with the propagation of the Balto-Slavic and Indo-Iranian languages. R1a was the first to reach the Low Countries and northeastern France, with the Corded Ware culture (2900-2400 BCE), a late Chalcolithic and early Bronze Age expansion of the Yamna culture. Lineages dating from this period would belong to the Z283 subclade. The Proto-Celto-Germanic branch of R1b (L11) settled around Bohemia and eastern Germany circa 2800 BCE and established the Unetice culture, the Bronze Age culure which would expand across all Western Europe and Scandinavia over the next millennium, and replace the Neolithic/Chalcolithic Bell Beaker culture. An expansion of Unetice to the north and west gave birth to the Proto-Germanic branch (R1b-U106), which mixed with the indigenous populations of northern Germany and the Netherlands, notably I2a2a-L801 (descended from Mesolithic Europeans) and R1a-Z283 (descended from the Corded Ware culture), but also with a minority of Neolithic lineages (G2a, E-M78, T1a, etc.). From 1700 BCE, R1b-U106 people penetrated into Scandinavia, where they blended with the local I1 and R1a-Z283 populations. 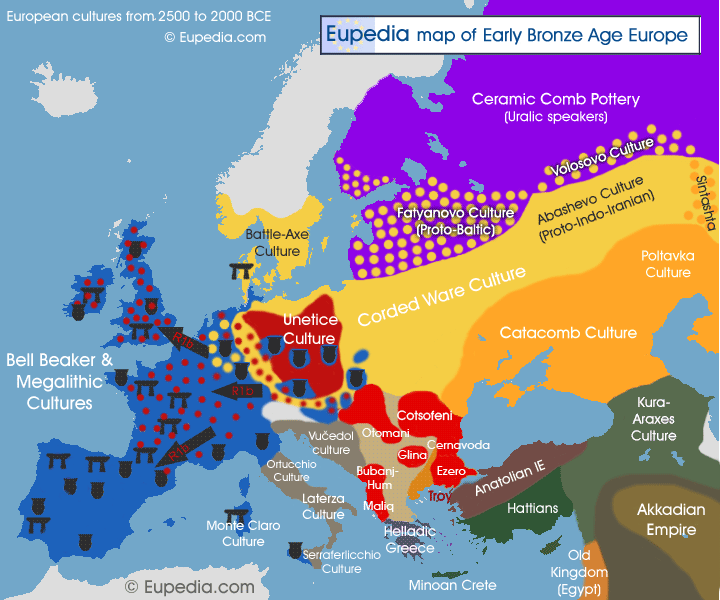 Judging from the propagation of bronze working to Western Europe, those first Proto-Celts reached France and the Low Countries by 2200 BCE, then the British Isles by 2100-2000 BCE. This first migration would have brought the L21 subclades of R1b to Northwest Europe. Through a founder effect, L21 became the dominant paternal lineage among the ancient Britons and Irish, and remained it among modern Bretons, Welsh, Highland Scots and Irish. Another migration from Germany appears to have been led by men belonging to the DF27 subclade of R1b and conquered Southwest France, then the Iberian peninsula. DF27 is now the most common paternal lineage among the Gascons, the Basques and the Catalans. The third major Proto-Celtic branch was R1b-U152, which is thought to have evolved from the successive Unetice (2300–1600 BCE), Tumulus (1600–1200 BCE) and Hallstatt (1200–500 BCE) and La Tène (450-50 BCE) cultures north of the Alps. Two potential migrations from southern Germany brought U152 to Italy from around 1700 BCE (Terramare culture) and from 1200 BCE (Villanovan culture), where they became the Italic tribes, including the Romans (=> see Genetic history of Italy). The Iron Age started around 1200 BCE in the Eastern Mediterranean and caused the collapse of many Bronze Age civilizations such as the Mycenaeans in Greece and the Hittites in Anatolia. From 800 BCE, the Iron Age was in full swing in central Europe with the Hallstatt C culture expanding from Austria and Bavaria all the way west to Alsace and Lorraine and east to Bohemia. Between 650 BCE and 500 BCE, Hallstatt Celts took over practically the whole of France and Wallonia and settled in southern England and in the western half of the Iberian peninsula. The Hallstatt culture was replaced by the Classical Celtic La Tène culture, which expanded north to Flanders and the southern Netherlands, south to northern Italy, and east along the Danube, eventually crossing the Bosphorus and founding the Galatian Kingdom in central Anatolia. The La Tène culture is the one most strongly associated with the ancient Gauls. The territory of Gaul encompassed all modern France, and all the Low Countries south of the Rhine, as well as the German Rhineland, which happens to be the region where U152 is found at the highest frequencies outside Italy. U152 can therefore be considered to be a marker of both Gaulish and Italic ancestry, depending on the subclade. Gaulish invasions of northern Italy, the latter Roman conquest of Gaul, and the numerous intermarriages across the two sides of the Alps mean that both Italic and Gaulish subclades are found scattered across Western Europe nowadays, which makes it more difficult to distinguish the Celtic from the Italic branches. Nevertheless, at present it appears that the Z36 subclade is mostly Gaulish and more widely associated with the La Tène expansion, while the Z56 subclade appears to be mostly Italic/Roman. The largest U152 subclade is L2, which expanded from 2500 BCE and therefore precedes the Celtic and Italic split. The L2 branch is more common in former Celtic countries, but also across Germany and Poland, and would have spread with older cultures like Tumulus and Hallstatt. Hallstatt and La Tène Celts did not belong exclusively to haplogroup R1b-U152, of course. They would have carried various lineages present in Central Europe since the Neolithic and the Early Bronze Age, notably G2a, E-V13, and probably also I2a2b-L38, I2c1, J2b2, and possibly some R1a (M458?) and T1a. Between 600 BCE and 300 BCE the Greeks founded colonies along the Mediterranean coast of France, founding Agde, Marseille, Hyères and Nice. The ancient Greeks would have brought chiefly haplogroups E1b1b and J2 with them, with also a minority of G2a, J1, R1b-Z2103 and T1a. Then came the Romans, who stayed for 500 years in Gaul. The Romans are thought have belonged essentially to R1b-U152 (particularly Z56, but perhaps also some L2 and Z192 subclades), with substantial minorities of E1b1b (probably more E-M34), G2a-L140 (L13, L1264 and Z1816 subclades), J1, J2 (both J2a1-L26 and J2b2), and T1a. Since many of these lineages could have come from other sources (Neolithic farmers, Indo-Europeans, and more recent immigrants like the Jews). Only a detailed analysis of very deep clades of these haplogroups could determine what is the actual percentage of Roman (or at least Italian) origin in the Benelux and France today, but data is still lacking at the moment. During the late Roman period, the Franks were allowed to settle peacefully within the borders of the empire around the territory of modern Belgium. The Franks were a Germanic tribe who originated somewhere between the northern Netherlands and Denmark. They would have belonged mostly to haplogroups R1b-U106 (about half of all lineages), I1, R1a (Z284 and L664) and I2a2a (L801). Nowadays approximately 40 to 45% of men in Belgium and in the Nord-Pas-de-Calais carry Y-DNA haplogroups of Germanic origin, most of which supposedly Frankish (but also Saxon and Viking in coastal Flanders). In the 5th century, the Burgundians, the Visigoths and other Germanic tribes invaded Gaul under of the pressure from the Huns, a tribe that originated around modern Mongolia. The Burgundians originally came from the island of Borgholm in eastern Denmark. In the late 3rd century, the Burgundians appear on the east bank of the Rhine, where they set up a kingdom in Worms, which inspired the epic poem the Nibelungenlied, immortalised by Wagner's opera Der Ring des Nibelungen. In 406,, the Burgundians crossed the Rhine and established a second kingdom further south. The Kingdom of the Burgundians (411-534) spanned across the modern French regions of Rhône-Alpes and Provence-Alpes-Côte d'Azur and Rhône-Alpes, as well as in Romandy (French-speaking Switzerland), but not in what is now Burgundy in spite of what the name suggests. The first Burgundian settlements were in Savoy, a region that happens to be a hotspot for haplogroups R1a (5%), Q1a (5%) and I2a2a-L801 (2%) today - three lineages that are particularly common in southern Sweden. The region has also approximately 9% of R1b-U106 and 8% of I1, the two dominant Germanic lineages in any tribe. Overall, up to 30% of modern paternal lineage around Savoy and in Romandy could be of Burgundian origin. The Goths originally hailed from southern Sweden, but had migrated to Poland and western Ukraine in the early centuries CE. In the middle of the 3rd century, they invaded the Eastern Roman provinces of Dacia and Thrace, before launching further attacks on Asia Minor. They subsequently became Romanised during the 4th century and settled down around Thrace (modern Bulgaria). In 410, the Visigothic forces led by Alaric I sacked Rome, then founded the a Visigothic Kingdom in Aquitaine in 418. By the late 5th century, the Visigothic Kingdom spanned from Gascony to Languedoc and started expanding to northern Spain. Allied with the Burgundians, the Goths attacked the Franks to the north, but were defeated by Clovis in 507, forcing the Visigoths to retreat to the other side of the Pyrenees. The Visigothic Kingdom survived for two more centuries in Iberia, where in its heyday it occupied most of the peninsula except the Andalusian coast and north-western Iberia. The Goths would surely have carried the typical Scandinavian paternal lineages (R1b-U106, I1, I2a2a-L801, R1a-Z284). Based on the more detailed Y-DNA data from Italy and Spain, it has become clear that the Goths had assimilated a large number of Proto-Slavic people before invading the Roman Empire. These Proto-Slavs would have carried apparently mostly R1a-CTS1211 lineages, and particularly the deep clades Y2902 and Y3301 (see Z280 phylogeny), the main and almost only variety of R1a found in Italy, southern France and Spain. A more minor Proto-Slavic lineage would have been I2-L621, also found sporadically in Italy, southern France and Spain. The genetic influence of the Goths in France and Iberia appears to have been relatively minor though. Paternal lineages of potentially Gothic origin reach at most 5% of the population in Southwest France, Catalonia and Castille and León, and are barely discernible in the rest of Iberia. The Huns had arrived in Europe from Mongolia through the Eurasian Steppe in the 2nd century CE, established an empire around modern Romania, Hungary and Slovakia in 370, and started incursions on the Roman Empire in the early 5th century. After sacking the Rhine and Moselle valleys and Frankish cities from Tournai to Orléans, they were eventually defeated by a coalation of Franks, Goths and Romans at the Battle of the Catalaunian Plains (near Châlons-en-Champagne) in 451. The Huns would have belonged to haplogroups C3, Q1a and R1a-Z93, lineages that account for a tiny fraction of modern paternal lineages in France and Belgium. Nowadays Belgians and Northeast French people sometimes carry a small percentage (0.1 to 1%, but occasionally up to 2%) of Siberian and East Asian autosomal DNA, which was presumably inherited from some Hunnic ancestors (or from Scandinavians via the Franks, Burgundians or Goths). After the fall of the Western Roman Empire, the Franks re-unified ancient Gaul under their rule and conquered most of Germany, Austria, Switzerland and the northern half of Italy (=> see History of the Franks). Between the 9th and the 11th centuries the Vikings settled in various regions of France and the Benelux (notably Normandy and Bruges), bringing a new influx of Germanic haplogroups (R1b-U106, R1a-Z283, I1, I2-L801), but this time with a higher proportion of I1, especially the Nordic I1a2 (L22) subclade, but also the typically Scandinavian R1a-Z284 subclade. Nowadays the Cotentin peninsula in Normandy has the highest percentage of paternal lineages of Germanic origin (~33%) after the Nord-Pas-de-Calais (~40%). Based on the present data, the haplogroup distribution for the Netherlands (Holland), Belgium and Luxembourg is as follow. The dominant haplogroup in the Benelux is R1b, almost equally divided between the Germanic R1b-U106 and Italo-Celtic R1b-P312 subclades. Both are present in all the Benelux, but with a very different distribution. R1b-U106 (S21) reaches its maximum frequency in Frisia (42%) and the central Netherlands (35%), then decreases progressively in the southern Netherlands (30%), Flanders (25%) and Wallonia (22%), to increase again in Luxembourg (32%). Not all subclades of U106 may be of Germanic origin. R1b-U106 originated nearly 5,000 years ago and settled in and around Germany around 2500 BCE, when Proto-Celto-Germanic people arrived from the Pontic Steppe via Southeast Europe. The term Germanic refers to the culture that arose in Scandinavia during the Nordic Bronze Age (1700-500 BCE) and the subsequent Germanic Iron Age. Some subclades appear to have expanded from Scandinavia and North Germany during that time frame. These include L48, the largest branch of U106, and Z18, another major branch. These also happen to be the two dominant subclades in the Benelux. Within L48, Scandinavians belong almost exclusively to the Z9 branch, while the L47 branch appears to be found mostly in the Benelux and Britain. The other major branch, Z156 is subdivided in DF96 and DF98. DF98 is also found in Scandinavia and could be considered Germanic. However the vast majority of Z156 in Flanders is DF96, a subclade that is very rare in Scandinavia. DF96 might be more Proto-Celto-Germanic and would have dispersed around Germany and the Benelux without passing by Scandinavia. The Late Bronze Age and Early Iron Age inhabitants of the Netherlands and the northern half of Germany would therefore have belonged to those Proto-Celto-Germanic subclades of U106, such as DF96 (and many minor subclades, see R1b-U106 phylogeny). It is not clear what motivated the Saxons to leave their homeland in the 5th century to migrate to Flanders and England, but one theory is that they were pushed by the expansion of Germanic tribes from Scandinavia, such as the Franks, the Burgunds and the Goths. Even ancient Belgic tribes were not necessarily all of Celtic descent. It has been argued that some of them were Celticised Germans. That distinction does not really matter in terms of DNA considering that both the Celtic and Germanic branches of Indo-Europeans descend from a common R1b stock, and that ancient Germania would have included a mixture of R1b-P312 and R1b-U106, that were neither purely Celtic nor purely Germanic, but that could rather be described as being of shared Proto-Celto-Germanic ancestry. Classical Celts are associated with the Alpine cultures of Hallstatt and La Tène, while "true" Germanics are the tribes that expanded from Scandinavia from the early centuries BCE. Before that expansion, the inhabitants of the Benelux, northern and central Germany would have spoken a blend of Celtic and Germanic languages, and as languages change with time, sometime for political reasons or because some tribes get displaced or have close contacts with other tribes, their respective language may not even have matched their dominant R1b clade. Tribes that underwent a major historical expansion in short lapse of time, like the La Tène Celts or the Germanics from Iron Age Scandinavia, leave traces of those sudden expansion in the Y-chromosomal phylogeny. The haplogroup tree does show a sudden diversification of subclades at one specific period in history, and that is how it is possible to tell that some subclades are much more likely to be associated with the Iron Age Scandinavians, the Anglo-Saxons, the Goths, the Vikings or any other specific Germanic people. In 2013, the Brabant DNA Project re-tested R1b participants for deeper subclades. Among the 218 confirmed R1b-U106, 48% belonged to L48, 8% to Z18 and 44% to other subclades (Z156 or DF96 were not tested but made up 37% of Flemish samples at FTDNA). Only 9 Walloon samples have been tested for deep clades. These include five L48 (including three Z9 and one L47>L163), one Z18 and three Z156 (all Z304+, with one confirmed S18823+ under the Scandinavian DF98). Six people from Luxembourg were tested for deep clades and all but one belonged to L48 (including two L47>L44 and two L47>Z159). The last one was a Z18. In other words 100% of the Luxembourg samples were Germanic. The sample size may to too small to judge, but it appears that Wallonia has a higher percentage of true Germanic/Nordic U106 (67%) than Flanders (56%), despite Flanders having a slightly higher percentage of U106 in total. This could be explained by the fact that the Germanic ancestry among Flemings is a blend of Frankish (from Denmark) and Saxon (from North Germany), as indicated by the analysis of toponyms in Flanders (many of which correlating with Anglo-Saxon place names rather than Scandinavian ones) while the Germanic side of Walloons is almost purely Frankish. Dutch R1b-U106 has a particularly large swath of Z18 (25% of U106) like Scandinavia, but with more diversity of subclades. The dominant branch is L48 (about 40%), which has about three quarters of Z9 for one quarter of L47. In contrast with Belgium, the Dutch also have a considerable amount of S1688 (about 15%, including U198), a subclade that reaches its maximum frequency in England, but is rare in Germany and mostly absent from Scandinavia, central and eastern Europe, Italy or Iberia. So far, S1688 has not been found in Wallonia or Luxembourg and only makes up 4% of Flemish R1b-U106. U198 might be native to the Netherlands and would have been brought to England by the Anglo-Saxons from Frisia. In contrast with Flanders and England this time, the Dutch have hardly any Z156, and the little there is is DF96, perhaps of Flemish or Saxon origin. Interestingly the high percentage of Z18 and L48>Z9 in the Netherlands resembles more the pattern observed in Wallonia than in Flanders. The main difference is that the Walloons have more Z156 (from Germany) and the Dutch more S1688 (native to the region). The other main R1b subclade in the Benelux is R1b-P312 (S116), which is found in equal proportions in Flanders and Wallonia (33%), but decreases as one moves north to reach 20% in the southern Netherlands, 15% in the central Netherlands and 10% in Frisia. Here is breakdown of R1b subclades in Belgium from the Brabant Y-DNA Project. About half of Belgian R1b-P312 belong to the U152 (S28) subclade associated with the La Tène Celts, Gauls and Romans, with a slightly higher frequency in Wallonia (16%) and Luxembourg (14%) than in Flanders (10%), and it keeps decreasing as one moves north to the southern Netherlands (6%), the central Netherlands (3.5%), and is almost absent from Frisia (1%). A bit over half of U152 in Wallonia and over 80% of U152 in Flanders belong to the L2 subclade. Wallonia seems to have more diversity, with a higher presence of typically Italic/Roman subclades like Z56 and Z192, but also of La Tène Celtic (and Belgic?) Z36. Autosomal ancestry analysis of Belgian individuals who tested with 23andMe shows that Walloons are much more likely than the Flemings to have a small percentage of Italian DNA (typically 2 to 4% + a few more percents of 'broadly southern European'), which is almost certainly of Roman origin. The Atlantic Celtic R1b-L21 (S145) lineage, most commonly found in the British Isles, reaches its maximum in the western half of Belgium (10%), including Flemish and Walloon Brabant, then decreases to 7-8% to the east of the country. Its frequency falls to 3-5% in the Netherlands, with little difference nationwide. Most of these lineages are probably of Gaulish origin, although some could have been brought by the Vikings from the British Isles, especially in coastal areas. The Vikings are well known to have taken slaves among the British and Irish populations, which they brought with them to their colonies (e.g. Iceland, Normandy) and back to Scandinavia. Nowadays, over one quarter of Icelandic paternal lineages and half of the maternal lineages descend from those slaves brought by the Vikings. In Norway the proportion is about 15% and 30% respectively. It would not be surprising if the Vikings also brought slaves to places they founded on the continent, like Bruges, explaining how some typically Scottish or Irish subclades of L21 ended up there. R1a was the other main Indo-European lineage. It spread mostly to Northeast Europe, Germany and Scandinavia with the Corded Ware culture, but its advance was stopped by the Rhine, which explains why both the (southern) Dutch and the Belgians have considerably lower levels of haplogroup R1a than all the Germans. Over half of the R1a in the Benelux belongs to the West Germanic L664 subclade. Other lineages include the Scandinavian Z284 subclade and the Central/Eastern European lineages M417 and Z280. Only a few R1a samples (from Luxembourg, Utrecht) belonged to the Z2123 subclade of R1a-Z93, which is of probable Middle Eastern origin (perhaps via the Romans). One R1a sample from Amsterdam belonged to CTS6, the Jewish subclade of R1a, also under Z93. Haplogroup I1, one of the most reliably Germanic lineages, has nearly identical frequencies in Flanders (12%) and Wallonia (10.5%), but is slightly higher in the Netherlands (16.5%), although that is still a far cry from the 35% observed in Scandinavia. Only Luxembourg has an surprisingly low frequency of I1 (2.5%), but this could be due to the tiny sample size. Deep clades were only available for 59 Dutch samples and 15 Belgian (mostly Flemish) samples. Two Belgian individuals did not belong to the main I1a (DF29) clade, but to rare branches (Z131 and Z17954). Four Dutch men were positive for the DF29 mutation, but not for any of the three known branches downstream (CTS6364, Z58 and Z63). The Nordic CTS6364 clade (including L22) was found in 18.5% of Dutch and 33% of Belgian I1 samples. The West Germanic Z58 branch accounted for 20% of Belgian samples (Z60>L573, Z138 and Z382 clades), and 63% of Dutch samples. Half of the Dutch Z58 belonged to the Z140 clade, which so far hasn't been found in Belgium. Z140 is found chiefly in Denmark, the Netherlands and Britain, and to a lower extent Germany. It seems that it is mostly a Frisian and Anglo-Saxon clade. The rest of Dutch Z58 belonged mostly to Z138 and Z382. The more East Germanic Z63 branch made up 13% and 12% of Belgian and Dutch samples, respectively. Overall, Belgians appear to carry a considerably higher percentage of Nordic/Scandinavian subclades of I1, while the Dutch possess mostly West Germanic clades. This could be explained by the higher percentage of Frankish ancestry in Belgium, since the Franks originated in Denmark. The majority of the Dutch I1 might be native to the Netherlands itself or neighbouring Saxony. I2 lineages are very varied. The project includes samples belonging to I2* (unidentified clade, probably I2c), I2a1b, I2a2a-L699, I2a2a-L801 and I2a2b-L38, whose origins are described in detail on the haplogroup I2 page. The very low number of samples for each clade prevents the identification of regional patterns, except for the Germanic I2a2-L801, which is considerably more common in the northern Netherlands than anywhere else. Over 80% of Belgian E1b1b samples and about half of Dutch E1b1b samples belong to the E-V13 subclade, which emerged in the Bronze Age and might have been brought to the Low Countries with the Proto-Indo-Europeans from Central Europe, alongside R1b and R1a lineages. So far, isolated samples have been found of E-M81 (Dutch province of Utrecht and Walloon province of Hainaut), E-M34 (Amsterdam, Rotterdam, Dutch province of Overijssel province, and Walloon province of Namur), E-V22 (Amsterdam, and Dutch provinces of Friesland and Overijssel) and E-V65 (Rotterdam). Haplogroup G2a was the dominant lineage of European Neolithic farmers. It would have arrived to the Low Countries with the Linear Pottery Culture, although some G2a would probably have been assimilated by the Proto-Indo-Europeans (notably the U1 subclade) on their way from Russia to Western Europe, and more G2a would have come later with the Romans (L13, L1264 and Z1816 subclades). T1a was also a major Neolithic lineage in the Fertile Crescent, but does not seem to have spread to Europe in substantial number during the Neolithic. It might have spread to Greece and Italy during the Bronze and Iron Ages, then come to the Low Countries with the Romans. T1a is considerably higher in Wallonia (4.5%) than anywhere else. The Romans would also have brought R1b-U152 (especially the Z56 subclade) and some subclades of G2a, J2a1 (such as L70) and J2b2. Haplogroup J2a1 reaches its highest frequency in Luxembourg (all of the M67 variety) as well as in the southern and central Netherlands (mostly M67). In Wallonia, at present haplogroup J2 has only been found in the eastern province of Liège (close to Germany) and one isolated sample J2-L70 in Hainaut. Flanders more variety of J2a1 (L70, M67, M319, Z6065). Interestingly, the most common J2a1 subclade in Belgium appears to be the PF5456 (under L70), which originated only 2,500 years ago and is likely to have been spread by the Romans. In the Netherands, about one third of all J2 samples belong to J2a1-M67, which is for the most part positive for the M92 mutation too, but isolated samples of Z467 and CTS6804 have also been found. Some M92 could be of Jewish origin (L556 clade), although few members tested for such deep clades. About 15% of Dutch J2 samples belong to Z6065 or L70 (including the potentially Roman PF5456 subclade), and 10% to the West Asian F3133/Z7700. One isolated sample of the Jewish S23560 has been reported, but the East Mediterranean M319 was not found among the samples in the project. All J2b in the Low Countries is of the J2b2a1 (L283) variety, and most of it falls under the Z1295 clade. J2b2 probably migrated from Iran to the Pontic-Caspian Steppe during the Neolithic, where it was later assimilated by the Proto-Indo-Europeans. J2b2a1a1 (Z585) is now one of the most common sort of J2 in Slavic, Baltic and Germanic countries, a point that suggests that it could have been diffused through the Corded Ware culture. One of its deeper clades is Z1295, which originated approximately 4,000 years ago. J2b2 has not been found in Luxembourg or Wallonia yet (perhaps owing to the small sample sizes). Flanders has very little J2b2 (0.5% of the population). In the Netherlands, J2b2 represents nearly a quarter of all Dutch J2, or slightly under 1% of the population. J2b2 in the Benelux seems to be concentrated along the North Sea board, in the western half of Flanders, Zeeland and Holland. Haplogroup J1 is one of the most common Jewish lineages, alongside E-M34 and J2a1. In the Benelux, J1 was found almost exclusively around Amsterdam and Antwerp, two cities known for welcoming Jewish immigrants in past centuries, while J2 was also higher in both in Holland and in the province of Antwerp. It is therefore likely that the differential of 2% for these lineages in Holland and Antwerp are of Jewish origin. The deep subclade analysis confirmed the presence of the typical Jewish J1 subclades (L816 as well as FGC15938, FGC15941 and ZS9492 under YSC76) in Antwerp and Amsterdam. At present it was not yet possible to distinguish for certain the J2 subclades of Jewish vs Greco-Roman origin. 23andme's Ancestry Composition tool is useful to compare the autosomal variations between countries and regions, especially for ancestry ranging approximately from the Roman period to the Middle Ages. We selected and analysed genomes of 57 Belgians from all Belgian provinces as well as 20 Dutch citizens and a few from Luxembourg. 23andMe's Italian ancestry is interesting as it may represent traces of ancient Roman ancestry. This component peaks in north-central to south-central Italy, approximately from northern Tuscany to Campania, where individuals generally have between 70 and 85% of Italian admixture, but quickly drops to around 50% in Lombardy and Piedmont, and only 5% across the Alps in Provence. That component has an average of around 1% in Belgium, but is slightly higher in Luxembourg (1.8%) and Wallonia (1.5%) than in Flanders (0.7%). Half of Flemish participants completely lacked it, especially those from the provinces of West Flanders and Antwerp. The highest levels in Flanders (2 to 3%) were in Flemish Brabant. Almost all Walloon participants had some Italian admixture, the highest being 3.6% in the province of Namur. In the Netherlands, there was a sharp divide between the southern provinces of Limburg and Noord-Brabant (1 to 1.5%) and the rest of the country (typically 0%), which is in agreement with the stronger historical Roman presence in the south of the country. 23andMe's Scandinavian ancestry peaks in Norwegians (50-95%), then Swedes (40-80%) and Danes (30-50%). Outside Nordic countries it generally represents Viking ancestry rather than overall Germanic ancestry, as the Scandinavian component is rare in other Germanic countries (e.g. 0-8% in England, 0-3% in southern Germany, Austria and Switzerland). Alongside Finnish ancestry, the presence of Scandinavian ancestry in western Europe would indicate Viking descent, as well as more recent Scandinavian descent in North Germany and Frisia due to the geographic proximity. There is a big divide between Dutch individuals, who may score from 10 to 25% in Frisia and Groningen, but only approximately 6% in the south, close to Belgium. The nationwide average is 13%. Belgians and Luxembourgers score in average 2.5% Scandinavian (+ 0.1% Finnish), a level equivalent to South Germans. Unsuprisingly Flemings generally have higher percentages than Walloons (3.9% against 1.4%), although that is especially due to people from north-western Flanders getting particularly high levels (5 to 10%), as individuals from southern and eastern Flanders are generally closer to Walloons. This is easily explained by the historical presence of Danish Viking settlements in the area that became the County of Flanders. The French & German and the British & Irish components are less useful to differentiate ancient ancestry in the Benelux, as they are both hybrid components mixing ancient Celtic and Germanic populations. The British & Irish component, although peaking in the British Isles, might represent Germanic ancestry of Danish, Saxon and Frisian origin in the Low Countries, where Insular Celtic ancestry in very low. 23andMe simply seems to have amalgamated all ancestries found in Ireland and Scotland to create this component, including Anglo-Saxon DNA. It should ideally be split in two to clearly differentiate Celtic from West Germanic ancestry. Outside the British Isles and France, this admixture peaks in Northwest Germany and Frisia, the ancient homeland of the Anglo-Saxons. It is higher in Flanders (23.5%, ranging from 16% to 38%) higher than Wallonia (17.5%, ranging from 6% to 30%), which makes sense since the Germanic ancestry of Flemings comes from both the Saxons and Franks, while in Wallonia is comes mostly from the Franks. Interestingly, the Dutch provinces of Noord-Brabant and Limburg get a closer score (17%) to Wallonia, and also have more Frankish ancestry historically. The northern provinces score 20 to 25%, similar to Denmark and Flanders. The Dutch average is 25%. The French & German shows the reverse pattern of the British & Irish component. This admixture probably correspond to a blend of Gaulish and Frankish ancestry. It is in fact higher in Wallonia (45%, ranging from 28% to 70%) than in Flanders (36%, ranging from 10% to 46%). The Netherlands also has a strong north-south gradient, with 40% in the south and 18% in the north. The French and German admixture peaks in Wallonia, southern Germany and Switzerland, a region were the Franks and Alemani/Suebi mixed with the descendants of the La Tène Celts. The last major admixture is the Broadly Northwest European, which is another amalgamation of various ancient Celtic and Germanic ancestry with a stronger Germanic bias. Its maximum frequency is in Denmark (34%), then the Netherlands (31.5%, with a strong cline from 40% in Frisia and Groningen to 28.5% in Noord-Brabant and Limburg), Germany (31% without clear regional divide), Nord-Pas-de-Calais (30.5%), Flanders (29%) and Wallonia (27%). It is considerably lower in Sweden (19%) and Norway (17%), as well as in England (23%), but reaches a maximum of 35% in East Anglia, the English region with the highest Anglo-Saxon ancestry. The Broadly Northwest European admixture may be related primarily to the Proto-Celto-Germanic R1b-U106, which reached Germany 4,500 years ago. Note that maps of 23andme Ancestry Composition admixtures are available here. Here is the haplogroup distribution in France based on the data collected so far. Click on a haplogroup name to sort the table by frequency. Over 5000 samples were taken into account. Note that the vast majority (> 80%) of samples could not be linked to a particular region of France because the source study did not only mentioned the region, or, in the case of commercial samples, the individuals tested did not know for sure region of patrilineal ancestry, as is common for North Americans and Parisians. Only half of the French regions had at least 100 samples. The others could not be listed here as the frequencies would be completely meaningless. The large number of unsorted samples explains the discrepency between the total of the regional data (including mostly outlying regions like Brittany, Flanders-Artois, Alsace, Gascony and Corsica) and the total for France (which includes probably much more data from central regions). Note that the total for France is biased towards North Americans of French descent (mostly from Québec), as genealogical DNA tests have not yet become popular among French people. R1b is the most common haplogroup in France. It includes four main subclades : the Atlantic Celtic R1b-L21 in the north-west, the Gascon-Iberian R1b-DF27 (including the Basque R1b-M153) in the south-west, the Germanic R1b-U106 in the north, and the Gaulish Celtic and Italic R1b-U152 in the east. The ancient Burgundians, a Germanic tribe from eastern Denmark, appear to have carried considerable percentages of haplogroups R1a and Q, two haplogroups that are now found at unusually high frequencies around the former Kingdom of the Burgundians, in what is now the Rhône-Alpes region and the north of Provence. Eupedia is partnering with Living DNA to map the genetic variations between the regions of the Benelux and France. Check the Benelux Regional DNA Project and the France Regional DNA Project to learn more about each project and how to take part.